Fatigue is a feeling of intense exhaustion, and it can occur at certain times of day or be persistent. Symptoms include heavy eyelids, lack of motivation, irritability, and difficulty with concentration. The nature of fatigue means that even the simplest of tasks can seem overwhelming, and this can interfere with everyday life. Many people struggle with fatigue after eating, and this can affect work productivity, as well as their sense of well-being. Read on to discover some of the reasons people suffer with extreme fatigue after eating. Another reason extreme fatigue after eating can happen is to do with the quality of the food. The body needs certain vitamins and minerals to provide the bones, muscles, and organs with the right nutrients. If a meal is full of highly-processed foods, then the body's nutritional needs are not being met, so a feeling of fatigue can ensue. Processed foods can also be full of unhealthy fats, which makes the digestive system need to work harder. A healthy diet should remedy this problem quickly. Sizes of meals is a big factor in fatigue after eating. If a meal is too big, the digestive system must work harder and you are not benefitting from the energy the food is providing. Big portions can also lead to “spikes and dips” in energy as you have larger gaps between meals, leaving your body hungry, followed by too much energy all at one time. The perception of fatigue will reduce if smaller portions are eaten more regularly because the brain benefits more from a constant and steady supply. Type 1 diabetes is a lifelong condition that means the person cannot produce enough insulin to keep their blood sugar levels stable. As a result, the person must modify what they eat or inject themselves with insulin. It is important to be diagnosed as soon as possible after the condition develops, because without the proper care, there is a risk of suffering from hypo- or hyper-glycemia (too little or too much sugar in the blood respectively), and these can lead to coma or even death. In addition to hyperglycemia, other processes that comprise type 1 diabetes may also contribute to heavy feelings of fatigue. Read other medical reasons for fatigue. There are a number of possible reasons for fatigue after eating, and most are lifestyle factors that can be changed quite simply. 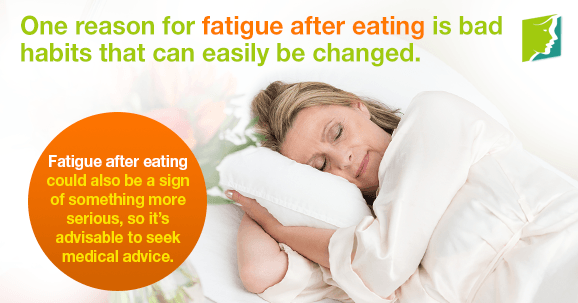 However, fatigue after eating could also be a sign of something more serious - such as like diabetes - because the body is experiencing a spike in blood sugar levels, leading to feeling fatigue and lethargy. It is for this reason that it is advisable to seek medical advice so that your doctor can rule out any underlying conditions. Are Herbal Teas the Best Solution for Fatigue? Fatigue and irregular periods are common symptoms of early menopause. Their leading cause is hormonal disarray. Learn more.